My Rating: Must read. You will Like it if you are, going to be, have been in Love. The book was first published in 1985. The translation in English was republished by Alfred A. Knopf in the year 1988. Nobel winning author Gabriel Garcia Marquez is known to be proponent of magical realism. This book is truly an example of that. This is a story of love, a love accomplished and sure in its being, a love thirsty and waiting to happen, sensual love, a love which is more of an act of habit, an unrequited love and a deep love, which sustains till it seeks, patiently and painfully lying in wait. The true art and capability of a writer is visible in not inventing sharp turns in the stories, and still keeping the reader hooked on the story by the sheer honesty and intensity of the life as we all know it. There are no sharp edges in the story. It is not a story told in hurry, nor is it written with the cunningness to impress the reader with the drama. It is a soulful river running through a beautiful and silent, blue night. In very short, this is a story of a love, very ordinary, but very touching by the virtue of its sheer ordinariness between the almond-eyed beauty Fermina Daza and Dr. Juvenal Urbino, an old couple grown old across the decades of togetherness. The man, a very habit-driven, custom-oriented hero for the community with a pronounced sense of societal propriety and his wife with a simmering sense of rebelliousness, come up as a creature of habit, a lovely couple very much in love. Then it is also the story of unrequited love of the eternal optimist, Florentino Ariza, who finds solace only in the end. The story begins with the visit of Dr. Juvenal Urbino to the death of his acquaintance, an Antillean Refugee, Jeremiah de Saint Amour- who quickly slips into a backdrop, not to come back again. The beginning seems merely to serve as a foundation to describe the social stature of Dr. Juvenal Urbino and his personality. He uses the journalistic devise of picking up and incident and builds a character over it. He is a dispassionate story-teller, whose allegiance is only to the story, not to the character. If one looks very carefully, one would find that he doesn’t attempts to get love, hatred or even sympathy of the reader to his character. He places the characters out for your scrutiny and allows you to wander through a maze of changing emotions towards them as the story progresses. He explains with a sense of passive seriousness which is descriptive to the extent of being journalistic. His facts create a world of fiction in which you not only believe, you also fall in love with. To quote him, he once said that it is, “a journalistic trick you can also apply to literature…” ..and that “…Journalism has helped my fiction because it has kept me in a close relationship with reality.” He gets you to believe in his fiction with factoids and imagery which may not always be true in strictest sense. He is a master in total control of his art. He is not helplessly flowing through the story, he steers it. He said in an interview that there is a purpose to the even the first, seemingly purposeless river trip of Florentino Ariza, that is to describe the river, so that it need to be described the second time over. Every word written serves the purpose of plunging you as a reader deeper into the story, so that you feel as if you know all the characters as the ones you knew from your own life. He carefully architects a world which the lady love of Jeremiah calls the death trap of the poor, in which to quote the author, the great old families sank into their ruined palaces in silence, as the world around collapsed into “the condition of honorable decadence..” We find the visual imagery of Joseph Conrad which makes a fictional world breathe in front of us. The character of Dr. Urbino is defined through a comfortable abode with all the assurances of familiar certainty, a parrot, a library, lovely house, throughout which one could detect the good sense and care of a woman whose feet were planted firmly on the ground. From here we slowly become familiar with Fermina Daza, the good doctor’s wife, who is seventy two when the story begins. 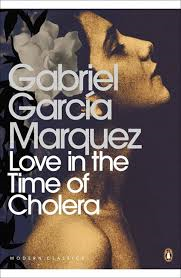 Gabo writes that, “Her clear almond eyes and her inborn haughtiness were all that were left to her from her wedding portrait but what she had been deprived of by age she more than made up for in character and diligence. The lady is sharp-witted, even if subtle and their story is a story of mild humor which makes up every decently happy married couple’s life. The wife loves pets, husband doesn’t as he tells her, “Nothing that does not speak will come into this house” and she responds by bringing in a parrot. The doctor teaches parrot Latin and spends evenings with the parrot until one day the parrot eventually causes his death by falling. As the author describes the loving couple, one could almost fall in the trap of traditional romanticism, almost. But then with playful innocence of a journalist, Gabo describes that…they were not capable of living for even an instant without the other or without thinking about the other before one is lost into the mushy-mushy feelings, he comes back ..neither could have said if their mutual dependence was based on love of convenience, but they never asked the question with their hands on their hearts because both had always preferred not to know the answer. I would presume this is what is meant by magical realism. There is an interesting description of their life, a charming life of togetherness, wherein she clung to last threads of sleep to avoid facing the fatality of another morning…while he awoke with the innocence of a newborn.. and her compliant that..the worst misfortune in this house is that nobody lets you sleep. This was a daily ritual, a game that all married couple play, that Marquez calls, dangerous pleasures of domestic love. Then there is an endearing episode of missing soap in the bathroom, which hits their blissful lives in thirtieth year of togetherness. He proposes that they go to the Archbishop and then seek his intervention on whether the soap was there or not that day in the bathroom. Fermina responds with the near-blasphemous thunder of “to hell with the Archbishop”. By the time, after four months of sparring in silence, one evening as Dr. Urbino waited in their bed for his wife to come out of bathroom “It felt so comfortable to be back in his grandparents’ featherbed that he preferred to capitulate and says he “Let me stay here,…there was soap.”, the reader is sunk deep in the feeling of a love so subtle, so dignified, so ..lovely that one also loves the couple. With this peaceful conclusion about the couple in love, about our own love for the couple, suddenly catastrophe hits with the parrot which tries to escape and trying to catch the parrot, Dr. Ubrino slips. It is brings too close the fear of old age death of someone deeply in love when he writes about the dying moments of Dr. Ubrino. Florentino is any other young man, reading love poems, believing in the infallibility of true love, and aware of the difficulty in such dreams of love given his own social station in life, as a fatherless child and poor young man. He finds Fermina, a lovely girl of a rich by dysfunctional family under the care of her aunt Escolastica. There is then, long period of waiting for the girl in park facing Fermina’s house reading his books, mustering courage to write to her. Then the first letter, and then more, letters, hidden in one place or other. There are such lovely descriptions of soaring, innocent love of youth which is brave and afraid at once. As he writes about Fermina who would lock herself in bathroom at odd hours and for no reason other than to reread the letter, attempting to discover a secret code, a magic formula…..in the hope they would tell her more than they said”. One forgives the first appearance of Florentino, after the death of Doctor Ubrino as one goes through the yearnings of Florentino’s struggle as young lover and eventual failure. The rationalist in Marquez comes back as eventually young Fermina is able to get over her love for Florentino as surprisingly as she fell in it. This was after she had formally accepted his love with a note sent to him which said, “Very well, I will marry you if you promise not to make me eat eggplant.” This after she fought with her formidable and brutish father when he found her a wounded panther who would never be fifteen years old again. Her aunt is sent away and so is she, but when she comes back, she finds her love is not there, that she has gotten over the love which she once had for Florentino Ariza. She goes on to marry Dr. Ubrino and Florentino slips into a dark abyss of lonely wait for the love which he still hopes to win back. There are flings which Florentino has in between, but they are more in line with the realism which Marquez writes about, but those flings are never able to touch, disfigure or damage the love, the magical love which flows in his heart for Fermina. Florentino is a dreamer, much like Jay Gatsby of Fitzgerald, who continues to hope even after Fermina’s marriage to Dr. Ubrino. He struggles through sadness and solitude, and eventually at the funeral of Dr. Ubrino once again confesses his love. Shunned by Fermina initially, and once again oppose by the society which stood against them, when they loved young, this time they bring out enough courage to sail into the sea together right into the sunset of their lives. Marquez once spoke about this book in an interview, “This book was a pleasure. It could have been much longer, but I had to control it. There is so much to say about the life of two people who love each other. It's infinite.” As a reader, I would agree to him. This is a book you end with a tinge of sadness, not because the story is sad, but because the story has ended. This book is a work of love, it celebrates love in multiple forms. Rare is to have one story which can contain so much of love in so many forms, hues and colors.